Gabry has lived her entire life behind the Barrier of Vista, a small protected town by the ocean, along with her mother, Mary. She's always followed the rules and played it safe, too terrified of the Mudo to even think about going over the Barrier. But then one night a group of teens, including her best friend's brother Catcher (whom Gabry has always liked), sneak out over the Barrier…with tragic consequences. Propelled by guilt and a sense of duty, Gabry is forced to push aside her fears and venture once more past the Barrier. There she meets Elias, a mysterious young man traveling outside of the protected areas, and their friendship will lead her to surprising discoveries that will forever alter her life. Carrie Ryan's latest zombie book is, like its prequel The Forest of Hands and Teeth, just as thrilling and adventurous as it is pensive and philosophical. Picking up twenty-some years after the heart-pounding conclusion of The Forest of Hands and Teeth, Ryan reveals another sliver of the world overrun by relentless zombies, called Mudo. Readers learn of a loose government and a string of protected towns, guarded by Recruiters, an army whose job it is to protect the people, and recapture land and supplies from the Mudo. Gabry's world is quite sheltered--she only knows about the outside from stories told by her mother and other adults, and so much of the story is about how she gathers up the courage to venture out into the unknown, trusting those she doesn't know, and learning from the past to try and create a better future, sometimes at a great cost. The Dead-Tossed Waves is very well paced as well. Ryan keeps readers on edge, wondering what will happen next and where the characters will go, and there is always plenty of action. Gabry's feelings about the two young men in her life are always changing as well, which provides for romantic tension and drama to keep the novel from being overly dark. Once again, Ryan has written an elegant, high-stakes, and utterly fascinating novel that will keep readers rapt. Cover Comments: This is a very beautiful cover--it's tempting and very eye-catching. I am not a big fan of the font of the title--it seems as if there should be something more elegant on the cover. Over all though, I think the cover fits the mood of the book very well. 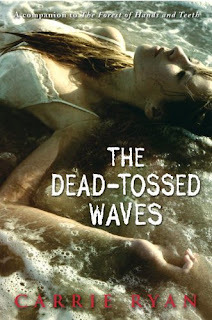 Check out my post about Carrie Ryan's book signing for her The Dead-Tossed Waves tour! I am reading this right now and am loving it! And I totally agree about the font. It seems so insignificant, but I think it's ugly compared to the rest of the cover.